udio Authority may be a relative newcomer to the PS3 accessory market, but they’re already well established in the professional audio/video accessory segment with a wide range of products such as switchers, audio and video converters, scalers, intercoms, video distribution systems, demo room equipment – the list goes on. A PlayStation 3 remote control converter would seem a perfect match to their design expertise! The BlueBeam model C-1070 was released early in 2009, and at that point Audio Authority was the largest company to so far tackle the PS3 control problem. With company size comes certain benefits, such as manufacturing capabilities, after-sales support, and worldwide availability through their distributor and dealer network. The BlueBeam is not, however, cheap. Priced at $129 USD MSRP it’s one of the most expensive products in our roundup, but it’s targeted primarily to Audio Authority’s customer base of custom installers and other industry professionals. While it’s safe to describe all of the products in this roundup as nearly featureless black boxes, the BlueBeam is an especially compact one and has the most unique shape. Measuring 1.86” wide, 1.39” high and 3.36” deep (4.7cm by 3.5cm by 8.5cm) it’s thicker than others but can be positioned horizontally or vertically, allowing it to fit comfortably in small nooks and crevices. The front of the unit features a tiny, not too bright red status LED for command feedback, while on the back you’ll find a selection of three ports: external IR input, USB and DC power. Two distinctive ridges that run around the plastic case are in fact removable rubber rings that serve double duty as both anti-slip feet and a frustration-free way to keep the battery compartment closed. Wait a minute, batteries? That’s right, the BlueBeam is the only PS3 converter that can be made completely wireless with two AA batteries as its power source. Battery life is claimed at a respectable 6 to 12 months with normal use. 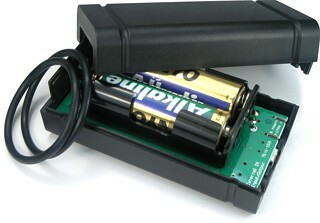 A low battery warning is offered via a blinking light on the front of the unit, and a starter set of alkaline cells are included with the package. That’s not to say batteries are the only power choice that Audio Authority offers – the BlueBeam can also be powered from any USB port that offers continuous power (such as some set top boxes), or via an optional DC input that supports a somewhat narrow range of 9 to 12 volts (the official power supply is model 571-013 for $25). 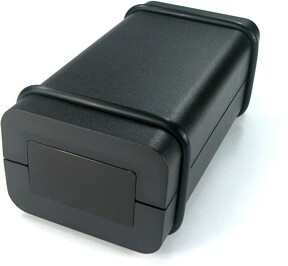 The BlueBeam can even accept an interesting mix of power options: if batteries are installed and the unit is hooked up to the PS3’s power port (which does not supply power when the console is off) then the BlueBeam will use batteries whenever the console is off, and switch to using USB power when the system is on. Hooking it up to the PS3 this way saves battery power, and has the added benefit of allowing the BlueBeam to physically track the PS3’s power state by knowing whether USB is supplying power or not, and then responding correctly to [Power On] and [Power Off] commands. Most other adapters only use a variable-based power tracking system that guesses internally as to the PS3’s state. By utilizing a hardware-based system the BlueBeam can sense when the PS3 is off... and when it’s still on. Unfortunately if the PS3 doesn’t turn off automatically with the [Power Off] macro, then the adapter can’t do anything about it... except sit there safe in the knowledge that the PS3 is still on and wait for someone to try turning it off again. For those who don’t wish to connect directly to the PS3, variable-based tracking is also offered.